There is nothing worse than shlubby looking knits. All that shlubbiness can be prevented with a little water, some straight pins and patience. Above are two pixie bonnets. The one on the right is just off the needles and super shlubby. The one on the left has been crisply blocked and is ready for finishing. You can buy fancy blocking mats at most any yarn store. I would love to have one (are you listening Santa?) but am way to cheap to buy one. Honestly, I don't see the need for special equipment. For smaller items, I line my ironing board with a trash bag (glamorous, I know). For larger items, I use that same trash bag on my cardboard, fold out, cutting board. The plastic keeps the moisture from wicking through to the absorbent support surface. The main advantage to using the cutting board in my small work space, is that I can pin down the garment at the kitchen table then prop the board up against the wall, or lay it on a bed, out of the way, to dry. For pixie bonnets, the ironing board does the trick. Cut a trash bag along one long side and the short side, leaving the other long side attached. Open the plastic and lay it flat on the ironing board. Using cold water, soak the knit garment. Gently squeeze out any excess water, leaving the garment damp. Lay the garment flat on the plastic lined ironing board. Flatten out the perimeter of the garment, use straight pins to hold the shape. Make extra sure to flatten any edges that are prone to rolling. At this point, finished dimensions come in handy. Shaping the garment to the finished dimensions ensures the item is true to size and a good fit. For the pixie bonnet I know the finished dimension from the cast one edge to the first decreasing row. At any time of year, blocking is a waiting game. For the in between seasons when its not really hot, but the heat isn't on yet, I use a fan to speed along the process. Any fan will do, position it a few feet away from the blocking board so the air is blowing across the garment. 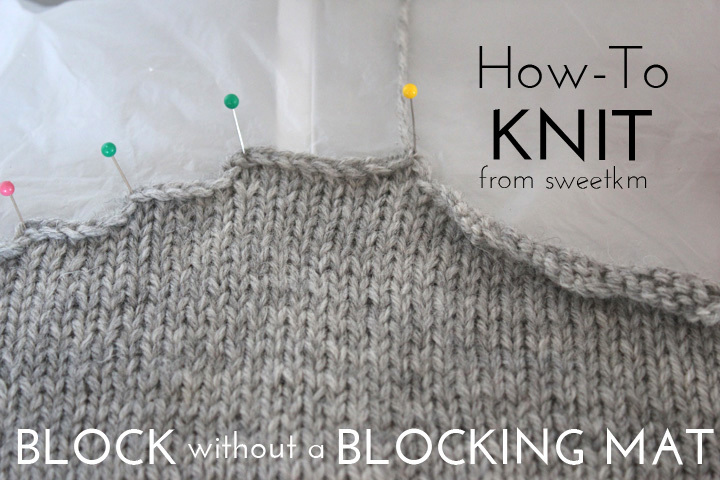 In hot weather, blocked knits will dry in a few hours. In the spring and fall, it can take a whole day, even with a fan. Be patient, it is time well spent. Thank you! I never blocked before because I didn't understand what a BIG difference it can make. Wow. I found your blog because your shop was on the front page of Etsy this morning (before 7am). Congrats! You make lovely things! I resisted blocking when I first started knitting (mainly because I'm too cheap to buy a real blocking mat). Now it makes me crazy when I see things that haven't been blocked. It does make a big difference.